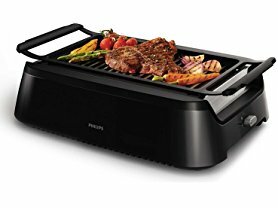 Hurry over to Woot.com because today (6/7) only and while supplies last this Philips Smokeless Indoor BBQ Grill is just $159.99 (Reg. $219.99)! Get delicious grilled flavor without charcoal or gas with this portable electric grill that's perfect for tailgating, backyard entertaining and quick weeknight meals. Powerful infrared technology heats grill quickly and maintains a constant 446°F for perfect browning without burning. Nonstick slats deliver authentic grill marks on steak, seafood, chicken, pork, veggies and much more. Special reflectors guide heat toward grilling surface to ensure even cooking with minimal grease splattering. Plus, the drip stray stays cool, delivering up to 80% less smoke than other indoor grills. This innovative grill sets up in less than a minute, and with nonstick grill slats and dishwasher-safe drip tray, cleanup couldn't be simpler.